Lentera Pendidikan : Jurnal Ilmu Tarbiyah dan Keguruan (p-ISSN: 1979-3472; e-ISSN: 2580-5223) is a peer-reviewed journal that mediate the dissemination of researchers in education, especially from Islamic studies, development of teaching and learning theories, and contemporary issues in education. The journal is published by Lembaga Pendidikan Tenaga Kependidikan (Teacher Training Institute) Faculty of Tarbiyah and Teacher Training Universitas Islam Negeri Alauddin Makassar in collaboration with Lecturer Consortium of Tarbiyah and Teacher Training. 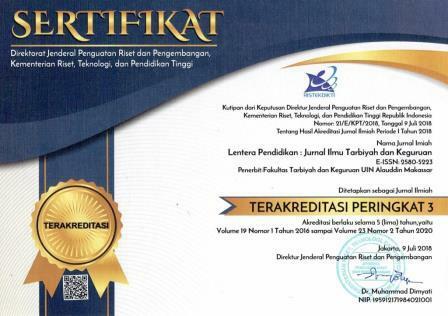 Lentera Pedidikan : Jurnal Ilmu Tarbiyah dan Keguruan is a change of name from Lentera Akademika, first published in 1997, then in 2013 changed the name to Lentera Pendidikan : Jurnal Ilmu Tarbiyah dan Keguruan. It has been indexed in SINTA 3 (Accredited Journal, Decree No.21/E/KPT/2018) by Director General of Strengthening Research and Development, Ministry of Research Technology and Higher Education of the Republic of Indonesia in 2018. The indexing status will be active until 2020. The editorial goal is to provide a forum exchange and an interface between researchers and practitioners in any education related field. We accept submission from all over the world. All submitted articles shall never been published elsewhere, original and not under consideration for other publication. Lentera Pendidikan : Jurnal Ilmu Tarbiyah dan Keguruan Call for Papers 2019. We invite you to submit your paper to Lentera Pendidikan : Jurnal Ilmu Tarbiyah dan Keguruan. The editorial board welcomes complete unpublished and original works on education, especially from Islamic studies, development of teaching and learning theories, and contemporary issues in education.